Well last night was something else. We had one hell of a thunderstorm during the night, just like you see on the horror movies. It rained and hailed, with thunder and lightening so bright it lit up everywhere like daytime. The noise of the hail hitting the RV was very loud, and the storm itself lasted about an hour with the peak lasting about 30 minutes. During the storm The Chef got up, dressed and sat watching it from the cab. On her way back to bed she noticed the floor was wet, and on further investigation found that the hail had smashed holes in the bathroom and lounge skylights and was getting in. Luckily all skylights except the bathroom had a tightly fitting piece of plastic covered foam placed in them, which act as both shade and heat retainers. These certainly limited the damage. In the morning we arose to find the front skylight above the cab-over bedroom had also been broken, and the one in the bedroom had been badly cracked but had not been holed. I came up with a cunning plan of repairing all four using opaque, flexible, plastic cutting sheets The Chef uses in the kitchen, cutting them in to pieces and sticking them down over the holes with duct tape. To prevent further damage I would make square shock absorbing pads out of bubble wrap. Rosina popped down to the Post Office to see if they sold the bubble wrap, which they did not, but the lady behind the counter did tell her that they’d not had a storm like last night for a very long time which was of little comfort to us. In the absence of bubble wrap I made square pads out of two layers of rubber woven matting which we use on the shelves to prevent articles moving around in transit, and covered each pair with cling film to make them waterproof. These were then stuck down over the repaired holes. Hopefully these repairs will not only prove to be waterproof, but in the event of further hail, also shock proof, and if they stay in place as we drive along – windproof. After the repairs the roof and vehicle sides had to be scrubbed down to get rid of all the leaves which had stuck to it from our neighbouring tree. 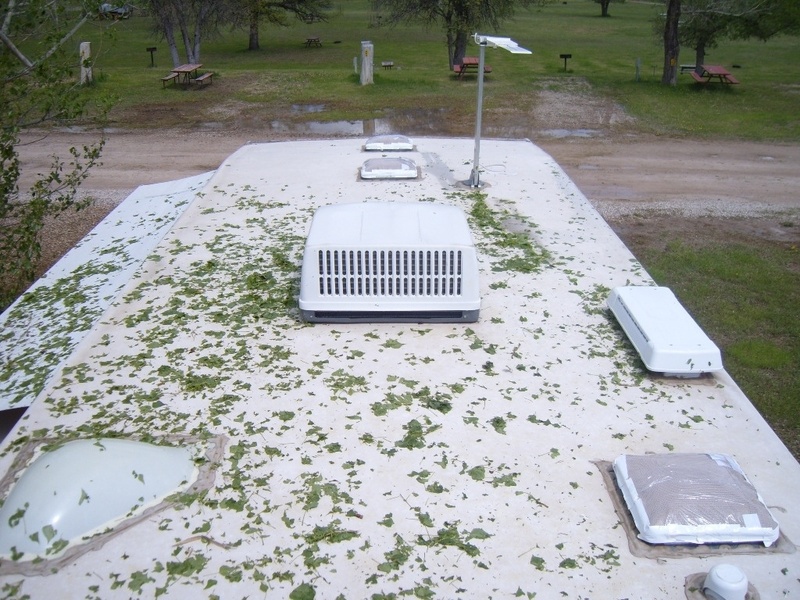 All the repair work was finished by lunchtime and I was satisfied that we were prepared for any further thunderstorms which may come our way until such time as we can get all 4 skylights replaced. 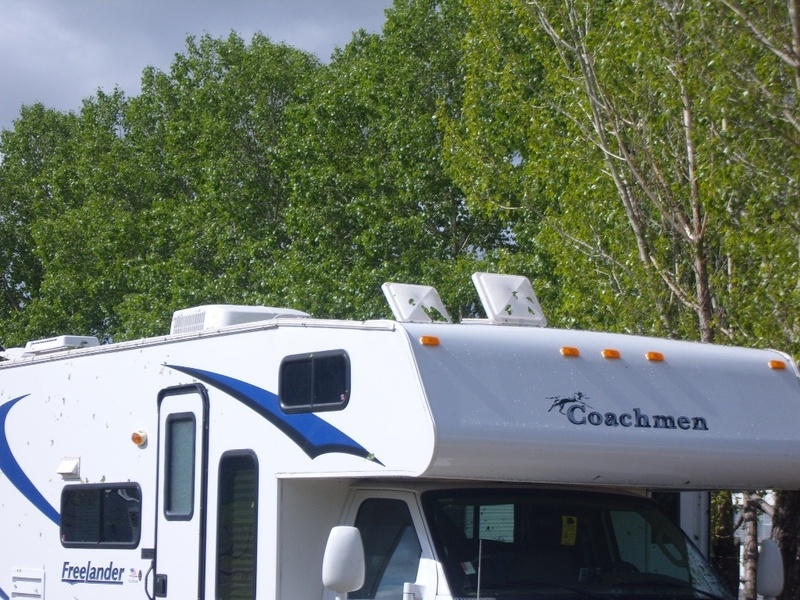 Quite a few RV’s suffered damage, including a German couple across from us who were in a 24ft hired motorhome, and who had not had the benefit of the plastic cushions in the skylights and as a consequence had pots and pans catching the water. I think everywhere in their RV was quite wet and we did feel sorry for them. A large number of campers left this morning, but we’re staying until tomorrow, come what may. After lunch we got the folding bikes out and rode in to the Devils Tower National Monument Park. We had to pay $10 to get in but the really helpful lady Ranger told us that their annual $80 pass would save us a lot of money and that any money we had spent on National Park entry fees so far would be credited against it. I told her we may well come back and see her later in the day. The journey to the visitors centre was a three mile uphill ride and so we decided to make our lives easier and walk with the bikes whenever pedalling them became hard work. We passed a field of prairie dogs in their burrows and they seemed fairly happy to pose for pictures once they got used to us being there. When I applied my brakes to stop the bike the front brake blocks became off-centre, and as I pushed the bike slowly along to join The Chef ahead of me, the squeaky, rubbing noise the brake blocks gave off at each revolution of the wheel caused the prairie dogs great excitement, I’m sure they were trying to communicate with my front wheel. At the top of the hill we reached the Visitors Center, close to the base of Devils Tower itself, and sat in on an interesting talk by a Park Ranger. We then walked around the area before making our way back. We were keen to get on the move as the sky was starting to look rather threatening. The trip back didn’t take much effort as it was all downhill. On the way we spotted some deer just yards from the roadside, and fortunately as we were on bikes, we didn’t spook them with our silent approach, enabling us to take a few good photographs. On our return I noticed I had caught the sun quite a bit. What a difference 12 hours makes. Last night I would have been beaten to death by hailstones, and this afternoon fried by lovely sunshine. Rosina went to her folders and dug out all of the receipts she had for National and State Park admissions since our trip began. Armed with them we went back to see the helpful lady Ranger. Sure enough she added up all of the receipts, and as we’d already spent over $100, were issued the card for free. This evening we went to see ‘Close Encounters of the Third Kind’ which is shown outside on a large-screen television at 9pm every night at the campsite. After a while it became a bit chilly sat there and so we decided not to stay until the end of the film. It’s just one of the things you have to do whilst you’re here as Devils Tower is featured heavily in the film. We won’t have to worry how the film ends, as I have a copy on DVD back home in England. Tomorrow we are making our way in to South Dakota on the final leg of our trip before starting the long run southwards to Fort Worth. Hopefully the night will not be spoilt by another thunderstorm such as we had last night. We didn’t sleep too well last night camped at Wal-Mart. For the first time ever in a Wal-Mart car park we were joined by truckers, some of whom decided to run their engines none stop. I even moved the RV to the other side of the car park and hid behind another truck to try and deaden the noise. It helped a little, but there was a lot of HGV traffic in and out all night. This morning we just couldn’t be bothered to have a shower and so had a good wash instead and saved the water in case we needed it tonight. Once we’d had breakfast we popped down the road to ‘Home Store’, a DIY chain just like B&Q back home, and checked out their gas BBQ grills. We found one that looked as if it would do the job and rather than carry it back, we picked it up as we left town. I was even cheeky enough to put it together in the store and leave them with the cardboard box and wrapping. On the way to Devils Tower using I90 we stopped by in the town of Buffalo. Parking the RV was tricky and we finished up leaving it in a back street one block down from the main street. There were a few historical looking blocks of shops and a hotel on both sides of the road, and that was about it, the rest of the town looked like so many others. What it did have was sunshine, and it was very pleasant just being able to walk about in it again. 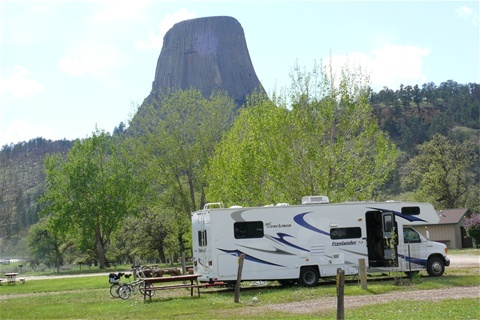 We then continued our journey to Devils Tower, stopping just once for lunch. Throughout the journey we tried without success to phone the campground to see if they could accommodate us two days earlier than planned, and to change the booking from one night to two as I feel in need of a day’s relaxation. The driving has been quite demanding over the past few days, not helped by having an AT&T mobile phone who probably provide better coverage on the moon’s surface than on the West side of America. Soon after arriving at Devils Tower we were greeted with a thunderstorm, but very little rain. The campground itself is right next to the entrance to the Devils Tower National Monument so we really do get an excellent view of the tower.